For the most part, I do lessons with my nine-year-old in the mornings, right after breakfast (around 9am), and we finish about lunch time. I do lessons with my kindergartener right after lunch, and that takes about an hour. 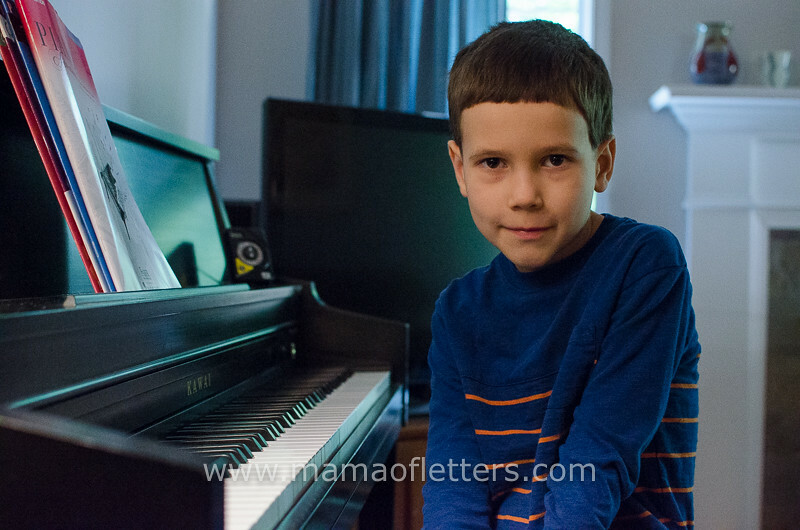 During the mornings, my six-year-old plays by himself while I do lessons with his brother, although sometimes I can combine their work, especially if we’re playing a math game, so he might join us in the mornings. For the first time, we have quite a few weekly appointments which happen on Tuesday, Thursday and Friday mornings. I can squeeze in math on Tuesdays and Thursdays for my nine-year-old, but on Fridays we don’t do any lessons because my son is taking a pottery class, and that takes a lot of driving time and energy. Because of our limited time, I have also started doing school on Saturday mornings. …..I know! I’m becoming a hard-nosed homeschooling mom! On top of this, my nine-year-old has chosen (this is completely child-led) to take piano lessons, which requires him to practice twice a day. The practice started off about 15 minutes at a time, but as he progresses and the music becomes more complicated, his practice sessions sometimes can take 30-60 minutes each. Since he wants to do it, it’s great, but it definitely takes a big chunk of time in the day. I was worried about this schedule being too much for my children, which is why I’m writing this post two months into our school year, but so far, it’s gone well. 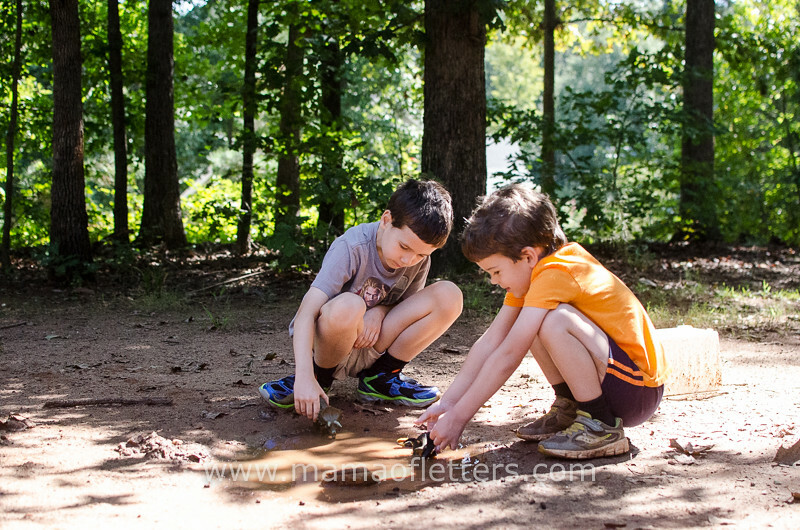 I can’t say that my boys love their formal lessons, but they are getting older and more mature, and they are both able to focus longer than they could in the past. And even though we have a lot of work to do, they still have time to play during the day. If they have a project they want to do, I skip lessons and give them time to do it. This hasn’t happened a lot, and that may be because I’m giving them too much formal structure, but then again, my eldest son’s project seems to be piano now, and my six-year-old still finds time to fill the floor with his coloring pages anyway! All of this is subject to change, of course. I am always trying to gauge when I need to push them to work harder on their lessons or give them a break to go play or do a project. It’s really something you have to think about when you’re homeschooling. I want them to succeed and learn how to work hard when necessary, but I also don’t want to push them too much. I want our days to be productive yet cheerful. It’s hard to balance everything, and it’s something that I just have to use my intuition on. I’m sure I’m not always on the mark, but I have well-behaved boys (most of the time), so I think that’s a good clue that we’re doing good. My goal this year was to have my son begin reading silently to himself. My husband helped achieve this goal when he bought our son a bunch of old Looney Tunes comic books for $1 each at some antique stores. My son read all of those, and after that I offered him some wildlife adventure books by one of our favorite T.V. ecologists, Jeff Corwin. They are right at my son’s level, and he’s finished the first one, and now he’s reading the second. I realize that I need to make time for him to read aloud to me so that I can make sure he’s reading fluently, and I haven’t done that enough, but he has been able to tell me about the stories in his books, so I know he’s comprehending them well. So I’ve moved on from teaching “reading,” and now we’re working on spelling, which is actually something my son mentioned he needed to work on. (I hope next year, we’ll move into writing/grammar, but it’ll depend on where he’s at.) I am using All About Spelling Level 1, and I really like it. My son is doing well, though sometimes it has been frustrating for him, and it’s caused some tears. (I don’t think anything I use to teach him this subject is going to be “tear-free” because this isn’t his thing.) To make it better, I don’t try to complete a step in one day. I try to keep it short. (The curriculum says to go at the child’s pace and make it light-hearted, which is exactly what I’m trying to do.) I also give him a choice between writing the words on paper or spelling them out with the letter tiles. To give him a jumpstart into writing, I occasionally take dictation from him. Last year, he wrote Volume 1 of The Plant Man, which he made up on his own. Not surprisingly, it follows a similar pattern to some super hero shows he watches, but I was proud of him for following through to the end even though it took a few months for me to work in the time to do it with him. While I take dictation, I don’t comment very much on diction, though I might explain how “it sounds better to say it this way” once in a while. My goal is not to teach him how to write, but to instill an enjoyment of making up a story of his own. He has plans to do a series of four books. I don’t know if he’ll want to finish that or not, but I plan to offer my services to take dictation again, which is usually for 30 minutes before lessons begin. My husband and I also read books to our son. Currently, I’m reading The Adventures of Tom Sawyer to him, and he loves it. I also try to do a read aloud in the mornings for both boys, but we don’t always have time. Currently we’re working our way through The Complete Tales and Poems of Winnie the Pooh. In September we moved back into our curriculum, and for my nine-year-old, I haven’t found anything more engaging than the Life of Fred series. He really loves those books and says he doesn’t want to do math any other way. So, we started Life of Fred: Dogs again (I had stopped it last year when it got a little beyond his level), and this time, we finished it in less than two months because we’re doing two chapters at a time, at least four days a week. Now we are working through Life of Fred: Edgewood, and I have the next book Life of Fred: Farming on my shelf so we can dig into it as soon as we finish Edgewood. I’m hoping he’ll be able to grasp the material in all these books so that we don’t have to stop. In addition to this, I give him more math practice by having him play math games and do the mental math sheets as I come to them in his younger brother’s Singapore math curriculum. I also found a little gem, Time Life for Children’s Right In Your Own Backyard: Nature Math. It’s not in print anymore, but it was for sale used on Amazon. Overall, it’s more at my kindergartener’s level, but I’m slowly making my way through the book with both boys and using a game in it to help with addition skills, etc. As I’ve written countless times before, my son’s main interest is in science, so I have not tried to do a formal curriculum with him. (At some point, I plan to do a systematic study of science, however.) 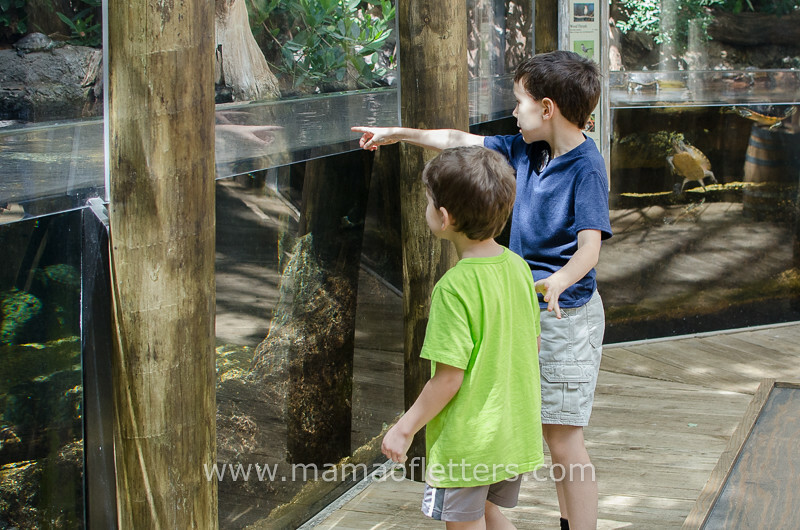 We have taken many Homeschool Science classes at the nature center in the past, and sadly, for the first time, they are conflicting with our other commitments. We did several science experiments last year, but since we’re very busy with outside appointments this year, I’m not putting that on the agenda. We still learn a lot through documentaries, reading science news articles, going on field trips to science museums and nature centers, and my son will be taking a six-week homeschool Chemical Engineering class by Engineering for Kids very soon. I have not referred to a curriculum to cover social studies because I know my boys learn so much through our daily activities. We visit museums, watch documentaries, and my son is a fan of News-O-Matic, which I include in our lessons, and it is a great tool for learning about current events and people’s jobs. My husband is a history professor, so our conversations are peppered with his knowledge. I also created a big history timeline which we’re utilizing, and you can read about that in How to Make a Big History Timeline for Your Wall. When my son gets a little older, I’m going to have him listen to his dad’s history podcasts. My boys are a step up in their knowledge of geography because we love looking at the globe and using maps, and last year I read them World Book’s Childcraft See The World, which I picked up for a $1 at a library book sale. 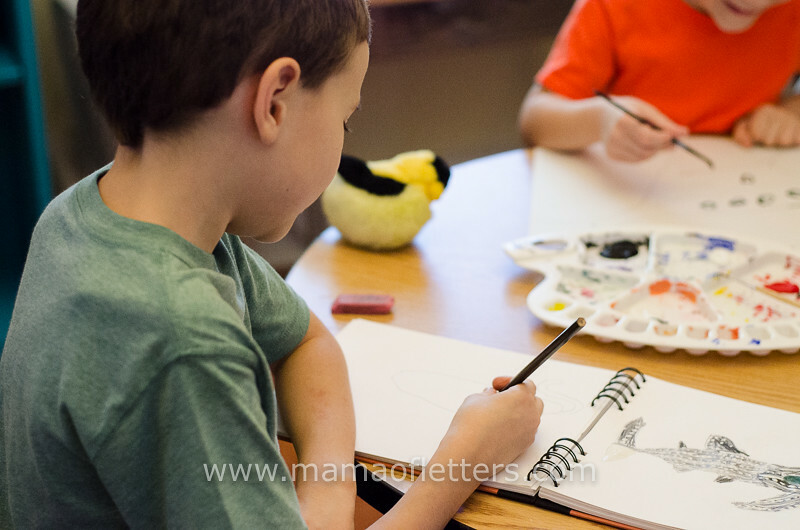 I have already written quite a bit about how I do Art Fridays, and you can see this page for information on all our formal art lessons. Currently, my son is in a pottery class on Fridays, and I sketch with my younger son during that time, so I’m not planning any formal art lessons. Going forward, there will be a conflict with our Art Fridays, so they might be temporarily suspended until I can work something else out. We have finally been working on our Spanish in earnest. We use Mango free through our local library, and we can access it at home, but I’m not sure we’re getting the full package through the library. (If anyone knows about this, please e-mail me.) I’m going to try something new soon, and if I like it, I’ll be sure to tell you about it. So far, this is what we’re doing for third grade. There’s a lot more to do, but it’s an exciting year! How about you?